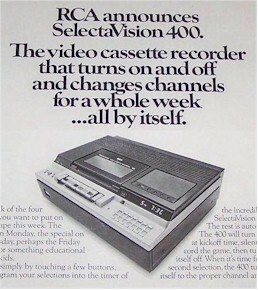 When this advertisement went out the best thing this RCA VCR could do was change channels. Modern VCRs don't have tuners attached to them so they could do something then they can't do now. The above pictured VCR was our first one. It was a heavy unit. Now Blu-ray players are light as a feather. Finally took a chance and bought a refurbished Sony SuperBeta HiFi Betamax on Ebay and am able to watch my old tapes again! Our Betamax seemed like a miracle. No commercials, no omissions, remote control (with a long wire) ; long lines at the first video store, pre-recorded tapes @ $75. I remember bare-bones VCR's going for $2200.00 in 1981 Sears catalogs. I bought a Sears Beta machine for $500--just as that format was biting the dust! That machine stayed in the shop more than it stayed hooked up at home. I think that's the first VCR I owned. Top loading, wired remote, and individual little tuning thumbwheels for each of the channel presets. After tuning, you'd slip a little plastic number in place to label it.